It’s a native of Caucasus region of Europe where tends to grow on the subalpine meadows at around 2000-2300m above sea level. It was introduced into the uk about 200yrs ago and has been used in our gardens ever since. It prefers a nice damp soil in a sunny spot in the borders, will take a little bit of shade as well. 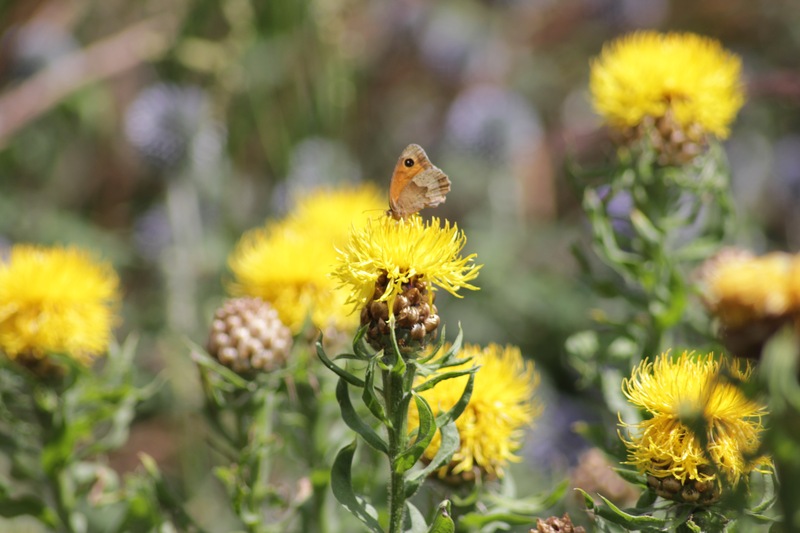 It is a difficult plant to use in gardens due to its height but as well as it’s attraction to butterflies it is also a tough plant and is disliked by both rabbits and deer, that makes it’s rather useful when they are a pain in the garden. It has uses out of the garden too and makes a great cutflower both fresh from the garden and also dried. They can be easily dried by cutting a newly opened flower and hanging up for 4-5 weeks in a dry shed. The name is also a brilliant one, Centaurea comes from Centuar Chiron, he cured a wound from a arrow dipped into Hydra’s blood by covering it with the flowers from the plant. Macrocephala comes from the Greek words, markos meaning large and kephale meaning head, so we have large head. It does take a few years to get established, but once it gets going, it forms a good clump up to 1ft wide with the plant growing up to 5ft tall. It is pretty easy to grow both from seed and also by dividing in the spring. It really is a beautiful plant, one that should be grown much more in our gardens. Next post: July just fluttered by……..